Human Cities Network, today, shares the purpose of the Toolbox which is one of the most important outcomes of the previous Human Cities festival in 2012/ Reclaiming public space. The Toolbox is a collection of tools or toolkits, developed to let people take action in their cities or neighbourhoods. The Toolbox was conceived under the direction of Politecnico di Milano and Cité du Design and coordinated by Strategic Design Scenarios. 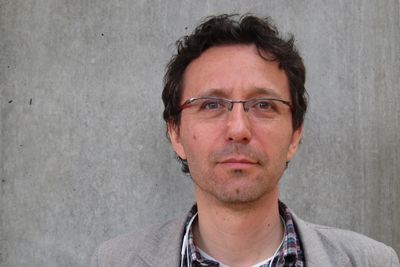 Human Cities took the opportunity to interview Francois Jégou of Strategic Design Scenarios to find out more about his strategies and developments of his more recent projects. What we found out was remarkably familiar to the purpose and strategy of the Human City Project today. This Interview is the result of a brief contact over the phone between Louisa Vermoere and Francois Jégou on Friday 5 February. What was your drive that made you develop the Toolbox? The mission of Strategic Design Scenarios is enabling people. We work a lot on social innovation and public innovation. I consider a toolbox as a kind of disease of designers, especially those working in service design. They make toolboxes when they don’t know what else to do to show the capacitation of communities. Beyond this self-irony, we co-design activities with public authorities. Generally we try to sediment our practices in the opposite way of what normally a consultant is doing. A consultant tries to develop tools and keeps them as a treasure to sell it over and over. At Strategic Design Scenarios we are doing the exact opposite. We develop methodologies and tools that are usable by non designers, non experts. Talking about toolboxes: could you clarify the difference or the relation between Sustainable Everyday and Strategic Design Scenarios? SDS is a lab, that I created. We are working, from a design point of view, on social innovation towards sustainable ways of living. Sustainable Everyday was one of our initial projects, which was a series of exhibitions, that travelled all over the world, for which we launched the Sustainable Everyday Project website. Today this website, is an independent publication tool that hosts part of the projects that have been developed as partner projects. The reason why is when you work for public institutions like the United Nations Environment Program, the Committee of the Regions, etc., it takes often very long to get the results of the collaboration published on their websites. You need many agreements, authorizations and signatures. And in the same time you are not allowed to publish things on your own website because the collaboration, the development is not your property. SDS uses that Sustainable Everyday Project as a platform, as some sort of neutral space, a public place on the web, to host projects and research we have been conducting in collaboration. Which of your projects relate to the Toolbox you created for Human Cities? Well not really a specific project has a relation but everything we do relates to the Human City project. Nevertheless local governance is our target level, we work with local authorities, because it is our purpose to make cities more sustainable. I will give you two exemplary projects. 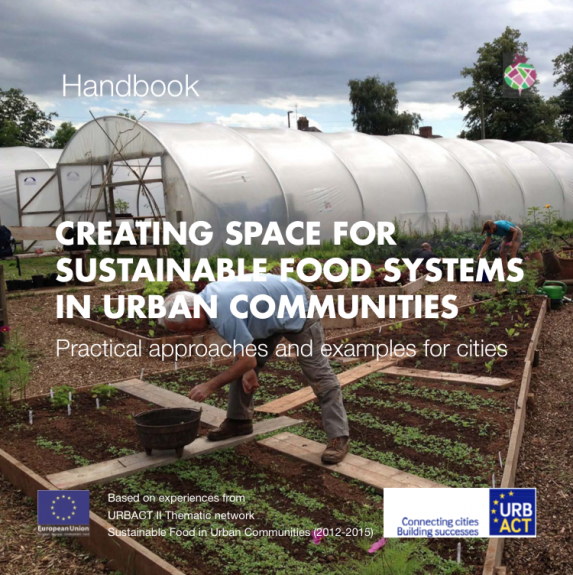 [caption id="attachment_1621" align="alignnone" width="573"] Cover of the Handbook, Creacting Space For Sustainable Food Systems In Urban Communities[/caption] ‘URBACT’ is the program depending from the European Commission, that organises networks of cities that are for three years exchanging on their practices and strategy of governance. We have led one of these networks and we are leading a new one at the moment. The first one was about Sustainable Food in Urban Communities (http://www.sustainable-everyday-project.net/urbact-sustainable-food/), so how cities are involved in the topic of sustainable food, which is normally a subject for which they have no official competence at city level. We established a three years exchange in a network between the Brussels- Capital Region (Lead partner), Amersfoort, Athens, Bristol, Gotheburg, Oslo, Ourense, Messina, Lyon, Vaslui, … More info can be found (http://www.strategicdesignscenarios.net/creating-space-for-sustainable-food-systems-in-urban-communities). The booklet is a publication of the exchanges between the different cities. The toolbox fostered the exchange and it elaborates on a selection of good practices. We are now in the beginning of establishing a new network of European Cities for the next two years on temporary use of vacant urban spaces and placemaking. It focuses involvement of all the stakeholders in the city to reuse back-end spaces and empty buildings. This back-end real estate is normally seen as a problem but when you take these spaces as an opportunity to develop cultural, social projects, they could boost the development. As a beginning we will publish a first book of 100 pages of 10 cities: Ghent is the Lead partner and the network includes Helsinki, Nantes, Poznan, Athens, Ostrava, Cluj, Amersfoort, Bremen and Riga. This book will elaborate on temporary use activities in these cities and on the six main topics on which we will work (in March 2016 in our online library at http://www.strategicdesignscenarios.net/category/library-menu). Although it involves more the governance level, it is very much related to what Human Cities I & II did. As a second example we co-developped on a Toolbox for Agenda 21; a project about territorial sustainable development led by the local authorities. It is active in Belgium, France, Canada, etc. It is a bottom-up stakeholder process with an action plan. We have worked for the redesign of Agenda 21 national policies for the ministry of environment in France. The issue that needed to be solved is that local authorities want to support sustainable projects but lack a vision to do so. They have a list of actions and they are randomly doing things but they don’t have a (clear) vision on where they want to go. In order to develop that vision we ask to the cities we worked with in France; why and wherefore you want to develop? Can you describe your vision? How do you see the small village, town, city, local territory in 10-20 or 40 years. To facilitate these answers we developed a toolbox called Vision+21 which engages in two days about 40 stakeholders: elected representatives, civil servants, citizens, industrialists, servants of the local territory to build a scenario. In the end the result is a small movie showing a collectively build vision of their territory (http://www.sustainable-everyday-project.net/boite-a-outils-visions-21/).